The area includes most properties in Queen Street up to and including The George P.H. and also includes the yards behind, 1-3 Brewhouse Yard and the Borough Market. From somewhat uninspiring beginnings (in the early eighteenth century Queen Street was known as Milton Backside), it appears to have acquired its present name in the early nineteenth century and now displays a strong Victorian character with some fine buildings from that period. Further back in time the road was believed to have been on the line of an ancient trackway or bridle path leading from Town Quay. 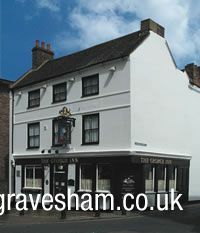 Although it forms part of the commercial heart of Gravesend, many elements make it a distinct entity in the town centre. It exhibits a variety of development types and styles. It has a subtle curve which means that its full length is not immediately apparent and the vista to the river is not, therefore as strong as it is in Gravesend High Street. At its southern end it is narrow and small-scale but as it progresses northwards facades become taller and grander. The most significant buildings are located in this northern part and include 26/28, dating from 1831, with decorative shell patterns above the first floor windows; The former Town Arms, with its robust architectural treatment and The George, a well-proportioned though plainer façade. The influence of the market is strong here and the area displays an almost bazaar-like character as a result. Environmental improvements including a simple but effective paving scheme, help to balance the variety of competing building forms and lift the quality of the area where it may have diminished through lack of repair or over-flamboyant displays.